STI was well represented at the 2014 PGA Merchandise Show in Orlando, Florida last week. The show offered golfers and golf merchandise dealers a glimpse at the newest products from manufacturers all over the world. Tuesday’s Demo Day at Orange County National Golf Club provided attendees an opportunity to test new products before they hit stores later this year. All the top manufacturers were there with everything from balls to clubs, shoes to…synthetic turf. STI displayed portable versions of the EZTee® products at the Demo Day, as well as a mini putting green. Of course, the weather didn’t cooperate. Strong wind gusts and rain thinned the crowd after noon, causing the show to be closed for about an hour. Demonstrations and lessons by top PGA teaching professionals were available throughout the day. The PGA Merchandise Show was held at the Orange County Convention Center in Orlando, occupying over one million square feet. According to PGAmagazine.com, over 41000 industry professionals were in attendance. Several STI products were on display throughout the show. STI provided all the turf displayed in the Social Media Booth at the show. Attendees were invited to step into this booth to see what was trending on social media sites at the show. They could also live tweet about their favorite new products. Toronto-based shoemaker, Bion Footwear, also displayed STI turf in their booth. On Thursday, the Bion booth hosted an event featuring live music, where many booth visitors took off their shoes and experienced a greener world in stockinged feet. Mizuno’s product testing booth at the indoor driving range featured both the EZTee® Hybrid and EZTee® Poly products. Visitors were given a chance to test not only Mizuno’s equipment, but also the playability of the EZTee® products themselves. 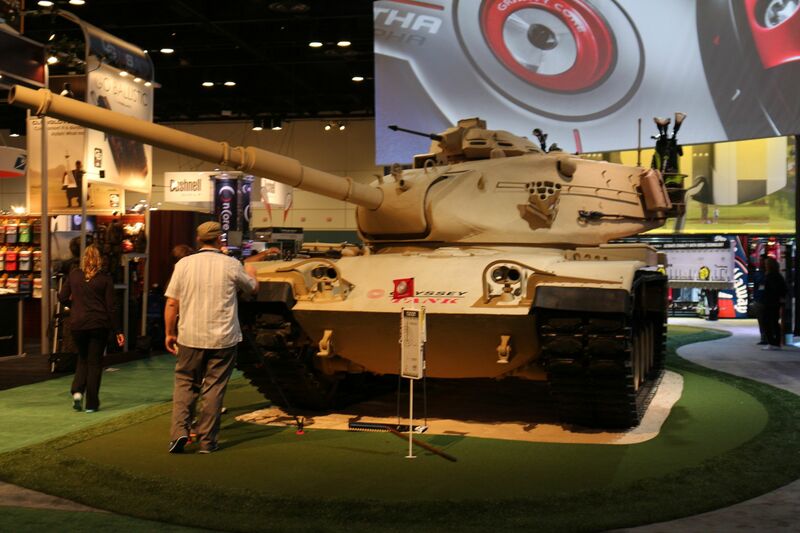 One of the major attractions at this year’s show was the full size tank on display at the Callaway Golf booth. 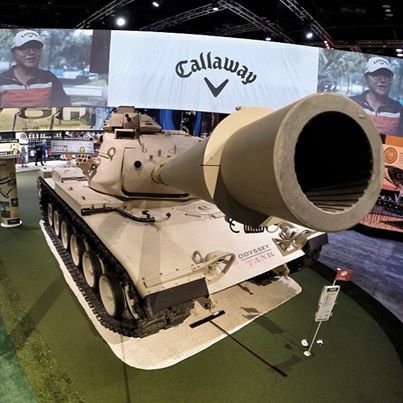 The tank was part of Callaway’s promotion of the Odyssey Tank Putter. The tank rested on a sand bunker in the middle of a putting green. The green was made up of STI turf, installed by STI dealers, and was part of thousands of photos taken throughout the week. The green provided STI an enormous amount of exposure at the show, and gave visitors to the Callaway Tank Putting Green a chance to experience the playability of STI’s NP 50® synthetic greens while testing out the Odyssey putters. Several of STI’s top dealers from across the U.S. and Canada were present to help out with everything from setting up STI’s own booth to talking with prospective customers about the wide range of STI products available. The STI booth featured two putting surfaces, and three EZTee® mats. The booth received lots of traffic during the week, which officially kicked off the 2014 season for STI. The weather was cold, and at times uncooperative, but all in all, the 2014 PGA Merchandise Show was a huge success. Visit our application page for more information, browse our gallery for ideas and contact Synthetic Turf International to Experience A Greener World…and a better golf game.